Remember how fun it was when you first started your blog? Writing great posts was effortless, and connecting with your audience was a pleasure. In a classic scene in the movie Drop Dead Fred, Phoebe Cates and her imaginary friend Fred build a colossal mud pie on the dining room table. They revel in the messy joy of creation and the fact that it’s going to infuriate her mother (aka the “Mega Beast”). Starting a blog is like making that massive mud pie. It’s a major undertaking, yes, but an exciting one. Everything is fun and interesting. Your creativity is soaring and you predict your blog will astound and awe the online world. Unfortunately, we creative people get bored easily and sometimes that new-blog luster wears off. Time passes, and you get sick of writing about that topic you used to love. You move on, and now you want to write about something totally different. So what do you do about your old blog? If you’ve put years of work into a blog, you may want to give option three some serious consideration. You can leverage that existing content and your site quality to build something new and amazing. If you’ve been online for a long time, you have a content legacy attached to your name. Google knows what you’ve been up to. The content you have posted to your blog is part of your online history. Completely erasing your content legacy and starting over is daunting. When faced with this problem, people often can’t decide what to do, so they do nothing at all and let the blog languish. That was my approach for quite a while. People who do a Google search on my name probably think I have some sort of multiple personality disorder. I used to write a lot of articles about how to use computers. Until I couldn’t stand it anymore. My most popular computer-related site, Computor Companion, was a multi-author site I started as an archive for a print magazine that I published starting in 1999. Although we stopped printing the magazine in 2001, we continued to publish online issues of the magazine through 2009. Needless to say, after publishing for 10 years, the site was large. With hundreds of articles and millions of visitors, Computor Companion was a content Mega Beast. In fact, even after completely ignoring the site for more than two years, I still get feedback on the articles almost daily and remain in contact with many of the authors. I never could let Computor Companion go. So many memories and online friendships are associated with it, I couldn’t part with the site. Up until recently, I couldn’t figure out what to do with it either. After the Google Panda update, the traffic started falling off because Google noticed that the site hadn’t been updated in a while. Clearly, I needed to do something. In Drop Dead Fred, during the last moments of that mud pie scene, Fred breaks open a Jack in the Box toy and plops Jack’s head on top of the messy creation. If you want to reposition an existing blog, that’s what you have to do too. You tear it apart and build it back up. That’s exactly what I did to relaunch Computor Companion. To arrive at the new direction, I looked at the readers’ problems differently. Most of my clients and many Computor Companion readers have used the information for business purposes. Then the new tagline hit me: Smart Ideas and Advice to Grow Your Business with Technology. I could write (and edit) articles about small business. Almost everyone uses computers in business, so the existing articles could still work within the new framework. But the software focus could be deemphasized in future content. To find a new angle for your blog, ask yourself: What problems — other than my central topic — does my content solve for readers? Coming up with a new idea is great, but implementation can be challenging. If you’re going to go to all the work of revamping a blog, you should think about why you want to do it. Our goals affected how we redesigned and rebranded the site. Think about what you want your blog to do for your business before you embark on any changes. Obviously, a site that hadn’t been updated since 2009 needed some design attention. I didn’t want to completely throw away the old design, so the site will keep a similar color scheme. Redesigning the site was relatively simple. For a blog, you can easily replace the theme to totally change the look. It’s amazing what a few color changes and a new header can do. In our case, I created a new logo that is reminiscent of the old site/magazine. We also added more white space and I rewrote all the static pages (About, Home, etc.) to reflect the new direction. I came up with an idea for an autoresponder and we added sign-up forms to capture email addresses. Our next trick was to recategorize all the existing content, so it would make sense going forward. In the prior incarnation, the site focused on how to use software, so that’s how the articles were organized. Now, with a small business focus, the articles are categorized into subject areas like Getting Clients, Developing Your Business, and Productivity. We deleted a few articles entirely and imported a few articles from another old site we were shutting down. At this point, some of the categories don’t have many articles, but there’s a lot of room for growth. The key to setting up categories is to think about how you want people to find the content. We had the technical expertise to dig into the databases and reassign categories. If you don’t have a resident geek, you may need to resign yourself to some rather tedious work reorganizing your content. Once we had the new site design in place and the autoresponder set up, we launched. When you launch a blog, it’s easy to get mired down in perfectionism, but the problem is worse when you’re retrofitting an existing site. You’ll undoubtedly have to compromise on a few issues. In our case, some articles aren’t perfectly categorized and there are a couple of articles we probably should have deleted, but didn’t because of the author. At this point, Computor Companion isn’t perfect, but it’s far better than it was. We have a new platform for great content that I can enjoy writing and editing going forward. The best part is that I have a site that’s no longer dragging me down. The prospect of adding new articles doesn’t scare or depress me. Ever take a blog or a website all the way to the ground and build it back up again? Ever think about doing it with your current site? Next article: Is Pinterest Traffic Worthless? Interesting post today as I have considered this very thing several times. I have been re-working my site though not quite to the extent as in this article. But it does give me some really good idea. Another great post here. Nice post.The ideas you have given are being so much helpful for my blog.It changed my view to operating blogs.This post is full of wonderful ideas.Thanks. A blog redesign and refocus can be the most liberating experience. Sometimes you feel like you’ve been backed into a corner (by your own doing) with you blog and you just want out. A redesign and relaunch can energize your content creation and really allow you to take off! Oh my gosh, yes. That’s exactly how I felt. Revamping it was such a relief, once I figured out what to do. The key to reinvigorating an old blog is to find a new niche to expand into so you get a little more room to breathe. For instance, for years I wrote an SEO blog, but after a while there isn’t anything that new or exciting to say. So I started thinking, what is related to SEO that my readers would find interesting? I branched out and started writing about social media and content marketing, both which are still relevant to an audience interested in SEO. You don’t have to completely revamp your way of thinking, just expand. Question – am currently in a discussion on this topic on LinkedIn where one frustrated blogger literally deleted all his old content, pages, post, etc. because he wanted to start fresh. The discussion has been focused on whether this is a good idea or not (he felt his old content/writing wasn’t that good and didn’t represent who he was today, thus it had to go). My thinking is that he just killed off 8 years worth of authority, backlinks, and content that constitute a major SEO no-no. Others in the discussion feel that he’ll maintain his authority, most backlinks are too root domain anyway, and won’t be bogged down with lesser quality content. I think you’d want to look at the stats to find out where the traffic was coming from and which pages were being linked to. That’s a good point. If some of the posts weren’t good, that’s probably a reason to delete them. However, with that said, I’m amazed at how many people still contact me to say thank you for Computor Companion articles I wrote 5+ years ago. This really got me thinking – thank you! Not only could you take a tired old blog and reinvent it, but it’s a process that can be used to reuse some of that old content that we put out there before we really found our voice, or got into the stride of blogging. Going back and revisiting older material to bring it into line with the current blog philosophy is something I try to do, but it’s a daunting task sometimes! Of course, another consideration is to ensure you don’t lose all the great SEO credit you’ve built up over time, which could be a challenge if the old keywords are no longer all that relevant. Essentially, you’d be starting over from an SEO point of view for certain things, depending on how drastic the overhaul is. I really like the bringing up of the “what to do with my blog”- question………..hm……….what would I do? a) Take down the old blog and start over with something new? b) Sell the old blog to someone who will give it the love and attention you once did? c) Reposition and revive the old blog? Well, I really like my blog and think I would just like to work on it and perhaps change the header a little? I think I´ve grown and perhaps should I reflect that in my header? But hen again, I get the words all teh time on branding and how important it is to stick to the SAME pictures and logos etc. so that people “recognize” you? I don´t know but why not dare and change?????? It´s tempting! Thanks for the inspiring post!!! There’s nothing wrong with updating the look of a blog. Copyblogger did that not too long ago in fact. They kept a lot of the same feel as far as colors and white space, but it was still a fairly substantial redesign, as I recall. Oh it’s not just you. Drop Dead Fred still totally cracks me up. wow – this came at a very opportune time. I’ve a gardening blog, and have also over a hundred gardening articles out there, linking back to it. However, after moving into a condo, and missing my garden and its inspiration, I’ve let the blog languish. Now I’m thinking – growing food – cooking – yup, I can revive that blog with some work. Since I’ve just published my first Kindle e-book, a recipe book about Quinoa, this opens up a whole new line of thought for me. Deleting my content is something I could never do, it would be like deleting my children! If a blog became stale then I’d always try and breathe life into it insteasd of killing it. I only deleted a few articles off Computor Companion. Mostly it was ones that were time-sensitive in some way. I did that with another blog I revamped as well. “Newsy” things don’t age well. One other tip thhat I would offer the readers, is to OFFER LESS at one time. Yep, it sounds a little counter-intuitive, but if you give your customers over-choice, they’ll end up chosing NOTHING. Mny blogs fall into this trap. You’ve got an add to click over here, a sweet offer over here, something shiny over here, and… oh wait, a light-box that just popped up asking for my email. When you decide on a focus for your site and you funnel each person towards that focus, and only that focus, then your conversion will increase and your overhaul will be totally worth the effort. I have struggled with the direction I want to take my blog. I tend to make it stale by just not updating it on a regular basis. I know I need to sit down and come up with a plan/calendar of post for the month, but am just be lazy and it shows in my irregular posts. Your post might be the push I need to get on track. I just need to set my goals. Creating an editorial calendar might help. At the very least, brainstorming a bunch of ideas and writing them down somewhere gives you a bunch of “fodder” to work from when you have time to write. Luv the new angle idea Susan. I did this with my cash gifting blog. I intend to see the blog through the eyes of my prospects, before each posts, instead of writing what I want to write about. Massive SEO boost, really solid traffic come from google, and my prospects, opt-ins, and team has grown, with my team doubling in the past 6 months. Taking a fresh, new angle makes all the difference. Thanks Susan. Thank you for your contribution, Susan, I am a fan of your work. No matter how good you are….after a while….you reach a saturation point. Your interest starts to taper off and you find your self withering on the vine. There are limits to growth even if you are a professional. The best thing to do is to start another blog. Or have multiple blogs. And follow your muse according to your subject and interest at a given point in time. For example, if you are in the mood to write about coffee, write about it on your coffee blog. Next day, if you get bored, well, write about meditation on your personal development blog. Third day you can write about the benefits of exercise on your fitness blog. There is no rule which says that you can only have one blog or a limited number of interests. Be versatile in order to get over your boredom. If you are versatile, you can always jump from one hobby to another. Life is too short to be little. No need to have a narrow focus. Expand your mind, broaden your horizons. At least that is what has worked for me, but it may not be everybody’s cup of tea. Have a good one. Cheers. I see you come from the publishing industries. People who write books go through a trial and error phase and and editing phase and then a go to market phase. Bloggers can’t gate jump unless they have a sizeable reputation someplace else. I don’t get that comment on deleting content. It’s your goal to meet your goals. I like Joshuas’ comments on too many avenues of distraction. It’s a design issue. Graphic designers prefer white space to clutter and so do I. I worked for designer Terence Conran in Visual Merchandise. It was our job to dress windows. The least cluttered and focused shop windows did best in Sales. Try all of these tips before you try anything radical. I did all of these last week and recieved 20 fold increase in traffic. Comment on 5 of the best blogs in you space each day. Also SWOT their blogs for their weaknesses and your opportunities too. Also see what’s working in your local mall. Look for the shops people are spending money in. Why? How could you use what retail marketeers they are doing to change your blog? Think about colour/ style/ offers/ customer service (read community building). A few years ago I thought about deleting an old blog and starting over. Quite a few of my friends said I should copy everything and save it if I really wanted a fresh start. I thought: Um, yeah, whatever. I’m so glad I listened! I spent the past weekend reading through five years’ worth of writing and all I can say is ‘thank goodness’ I kept it all. Now I see why some people have journals from when they were pre-teens. It’s helpful to see where you’ve come from in writing! Thanks for such a perfectly timed post. It was an inspiring post! I never applied the idea of a face lift/plastic surgery to a blog before. I know the disenchantment well, however. I’m also sorry to say that I have dismantled about 20 posts over the years. I’ll make sure I give more attention to revitalizing old blogs rather than just shut them down in the future. I can’t tell you how timely this blog post is. I’ve been thinking about redesigning my crochet blog, which started off as a hobby blog. I’ve been doing some haphazard monetization, but I realize that I need to find a new angle and set some goals before I go any further. I also want to redesign the look. This information in this post is going to help me organize my efforts. Thanks for sharing!! When I teach crochet, I deal with students who run the gamut in terms of that “coordination” skill set required to crochet. Some people catch on very quickly; I call them “crafty” (like some people are “handy.”) Others need more help getting the knack of holding the yarn, hook, and fabric all at the same time. I really like teaching the latter group because it challenges me to find new ways to teach them how to crochet comfortably. So your blog idea is actually information that some people might find useful. I’ll have to put it in my bag of ideas for consideration :-)! What perfect timing. I was just having a conversation with a friend last night about what to do with my blog & whether it needed a revamp or change in direction. It was only a thought which had occurred to me in recent days but in the last month or two, I’ve really struggled to find ideas to write about. My first step is to think about what other problems my content might solve? My content is rather specific & narrow but I’m sure I can come up with something. It’s actually an autumn (or should I say fall) clean for me! Thank you. I will come back & update this post to let you know how & what I do. This a great article. I know when I had my recipe blog I had or 2 years, how I started it and hen when I retired it, I had 2 different blogging styles. I constantly made it over, I had great audience I was up to 60,000 page views when retired. (health issues was reason I decided o retire it) I did just start a new one but already I changed my blogging style, it really does help. Terrific framework to dust off a good’ol blog Susan … I like the fact that you skirted on the issue of “perfectionism” when it comes to launching…It’s daring and I like it! Yes, perfectionism kills many a blog. Nothing is ever perfect. I think it’s better to have something out there than waiting until everything is “just right.” Because it never is. Agree … that guy was born to play Fred. In fact I’ve never seen him ever again, in any role! I like the idea of organizing your site over and giving it a facelift with a new theme. I think you can and will get allot out of that as long as your content is organized also. Yes, that’s a big part of it. You often need to figure out new navigation and new categorization to make it work. I loved reading about how you did this, Susan! Thanks for sharing your story. It’s both instructional and inspirational. Now I have to cruise on over to the blog and see what it looks like! My humor blog is almost three years old and I’m not ready to do anything drastic to it. I still feel like it’s in it’s infancy stage. I’m still figuring out how to promote it, what days are better to do blog postings, and how to get the people who send me texts or email feedback to start doing it by commenting on the actual blog itself. My website, however, is a completely other beast. 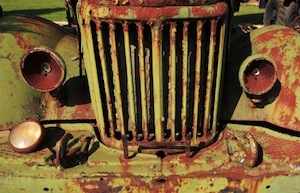 Whereas the blog is ok, my website needs to be completly bulldozed and laid to rest. I’m working on it though. Re-inventing products is something that is done all the time in the corporate world. Actually, I just noticed today as I was driving that all the McDonald’s have a new arch on their buildings. (I might be behind the times if this change is old). My point though is that re-designing and re-building can really be a good thing for a business. I agree. That’s a good point. You see reinvention all the time with varying degrees of success. You nailed the needle in the haystack. Even though I am quite new and novice when it comes to blogging, May I chip in my views on the subject? a. One should have clearly laid out reasons for a change – it can be just plain emotional (need for a change) or it can be any rational need ( a new topic requiring a totally new way of presentaion). b. Evalaute wheher the exisiting blog can meet these demands – If yes, then write down all and each reasons or justifications and review after some time; If no, still wite down ‘Why No’s and review, at least more than once, after reasonable gaps of time. c. Do follow ‘5 WHY’. d. Ensure that you have a clear reply with you: Whether you want a faceover, a makeover , a toatl overhaul or a new blog. e. Do you want keep your old blog alive – again , either for emotional or rational reasons? OR Would a connecting link(s) for carrying over the legacy connections can do the job? OR Has the break to be one clean swathe? Really interesting – I did get stalled about 8 months into blogging. I wasn’t having fun anymore and it was getting difficult coming up with new things to write about. Fortunately I worked my way through it and, like you, I basically repositioned my focus and while it wasn’t exactly a remake, I did freshen the look of my blog. It was just enough to make a huge difference – since then I find I have a wealth of things to write about. I think it was just a natural part of the evoluation of me finding my way toward the right mission. Actually, yes – I have torn down my blog and rebuilt it twice, now. Not exactly because I was getting bored with it, but because I gained some insights on how to make it much better than it previously was. A lot of it had to do with not having a clear direction for the content at first, then realizing that the direction I had decided on previously wasn’t effective. Now that I have a clearly defined niche in my content and have a regular post schedule in place – I can see a major difference in traffic and a lower bounce rate. It’s fantastic. Great advice, though. I’ll definitely be looking this up if I ever decide to make another shift. Hopefully many years from now. You just pointed it out. Great article ! I have set up a blog in 2009, just for the purpose of having fun and extend my HTML / CSS knowledge. In 2009 the feeling of designing and running a blog kept me motivated. My perfectionism mired my down after a while ( as you write it ), since I always needed to split my concentration between new features I wanted to implement, troubleshooting functionality issues and posting. Adding continously new content to a Blog while working on the main layout can keep you quite busy and can drag you down, since you do not get the feeling that there is a point at the end of the sentence and you finally can concentrate just on the content. So it took some time and I started to redesign my blog this year. Learning from my experiences and feelings I not longer want to have everything perfect. Ofcourse it is still important that things look good and are functional. But small issues do not longer drain my energy. In the last years I made some websites / webshops and started to recognize that from the angle of developement things always can be extended, improved, pimped up. One needs to find the point to say it looks ok , works and is useable. Since we all are creativ and a website or blog is a fantastic opportunity to live this out, you need to leave well alone sometimes when you project is in an acceptable state. In my case it is the same, a couple of old posts could be deleted or re-categorized. The time will come where I will do this. But I feel no rush that it needs to be perfectly sorted out instantly. And without this rush there is no pain in the neck. Thanks for this nice post. I totally agree with what you wrote. Yes, you’re right perfectionism and analysis paralysis are enemies of getting things done. It sounds like you’ve worked through it though. Write on! As a law student, who is fascinated by business, news and family life, I created several subdomains, installed WordPress on each, so that every topic has its own ‘castle’. It was ‘a lot’ of work doing so but I like the new site. Now I can freely write on all the topics I mentioned above and publish the content instead of letting my posts lie idle in my computer’s hard disk. -Should I create sub domains with different WordPress instalation or create a multi-site? -Should I create different Facebook, Google Plus, Twitter, RSS, mailimg list for each site? -How will I manage all the sites? -Should I delete some posts or rewrite them? -What will happen when my regular readers find there are siignificant changes on my site? Most people would say that it’s important to stick to one topic. However, like you, I get bored writing about just one thing, so I definitely understand your perspective. I have sites about small business, book publishing, caring for pets, pet adoption and rural living. The key is to try and post reasonably regularly on all of them and just do the best you can. It’s not the end of the world if some of them languish for a while. And realistically you probably won’t build up a huge audience on any of them quickly. It will probably be more of a slow and steady thing. And some sites may never gain traction at all. That is why marketing experts recommend against dividing your efforts like that. However, one thing experts almost never take into account the fact that creative people get bored easily. And if you’re bored, you won’t write anything at all. So to me, dividing your efforts and continuing to be creative is better than doing nothing. Wow Susan, you’ve really hit on a subject that’s resonating with people. Add me to the list. I’m announcing an entirely new direction for my blog tomorrow and the relaunch will take place over the next couple of months. Any tips on the technical side of moving from one domain to another and any hurdles I should be aware of? Your post has great timing. We are about to launch our new website which will have its own blog. We already have an external blog that still has relevant posts. Would it be better for us to copy over the best posts into the new blog and then remove them from the old or just focus on new posts and leave the old blogs where they are?